The elephant in my sewing room is finally finished! 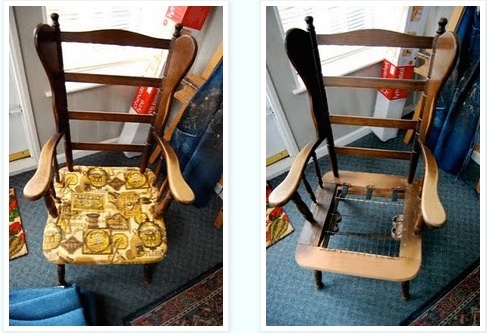 I restyled this rocker for a friend's nursery. It was supposed to finished before little baby M arrived. Um... she's six weeks old now. Better late than never is my mantra lately. What a project. I actually shed tears at one point, but in the end I'm glad I saw it through and completed everything. I'm very happy with the end result and I learned a lot about minor upholstery and furniture (through a lot of trial and error...). I had just come off my high of recovering my living room bench and chair when M.E. asked me about redoing an old rocker. I thought, sure! why not? I can do that in no time flat. No problemo. Never mind the fact that I know absolutely nothing about upholstery. I mean, I made a few pillows and thought I was an expert. 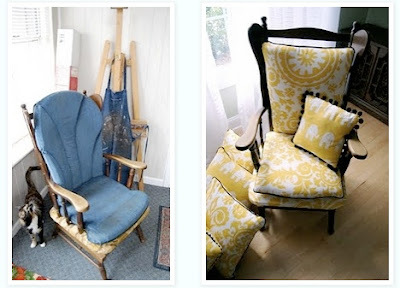 Now, fast forward two and half months later, four (back and seat, so eight really) different makes of cushion covers, at least two different sets of cushions made, new webbing and batting, five pillows and one inopportunely broken zipper..... But it looks good, right? The first thing I did was take off all the old fabric covering the bottom. As I pulled out staples and removed I saw just how old and dirty it was, including the batting underneath. It basically all disintegrated when it was removed. The original cushions were awful as well (there was a battery acid spill on the bottom cushion) so I decided not to use them either. I ended up cleaning everything off, leaving only the framework. It was only when I looked at the blank chair that I realized I had no clue what I was going to do. I had to start from scratch. The first thing I did was stretch new webbing over the seat opening. I did a little bit of research and decided the best option was to weave furniture webbing strips for additional strength. This is the only part of the chair I'm a little concerned with. I wonder how much the webbing will give out over time? I did not have the proper tool to stretch the webbing. My MacGyver husband came up with the clamp-and-two-pieces-of-trim tool thingy to help with the stretching process. I used it to grip the end of the webbing and then levered it against the end of the chair to stretch as I stapled. I stapled one row of staples, folded over the end of the webbing and stapled again for good measure (that was recommended on an upholstery site I visited). Also recommended was to use 9/16" staples. I used them on the webbing, but used 3/8" staples for the fabric. Had to use an electric staple gun for the 9/16" staples. I used super plush fleece instead of batting to cover the bottom of the chair since the old batting seemed flimsy. Then I stretched fabric to cover everything and stapled underneath. I had to work around all the spindles. I made sure to really pay attention to how it was done on the old cover as I took it off. It was tedious. Can you spot my helper? The biggest issue was making new cushions. I used 2" furniture foam and 1.5" inches of memory foam on top. I wanted them to be extra cushy. If you are crazy enough to try interested in making your own cushions, please learn from my mistakes. The cushion needs to be perfect before you ever even think of sewing a cover for it. Most of my many failed sewn covers came from the fact that I did not cut the foam evenly or smoothly. I assumed that the cover would smooth out any lumps, bumps or unevenness. Not true. The cushion needs to be smooth and perfectly formed ahead of time. Also, you need to take account of the fact that the foam needs to compress some to fill out a cover. I didn't factor that in the first two times. I would not add any seam allowance when you are measuring cushions for their covers. I cried after my third attempt. My husband deserves many thanks for helping me finish. I guess he doesn't like to see me cry :). He came out to the sewing room and re-cut the foam precisely. He also cut all the edges of the foam at an angle to get rid of sharp edges. He's very detail oriented if you can't tell from the tipi. Then I made a separate inner cover from a stretchy fabric. See how nice the cushion looks on its own? Makes all the difference. The covers zip up nicely and it will be easy to take them off to wash if needed. All that time and effort was well worth it. It was a paid job and I was paid entirely too much considering my slackness on time of completion (thank you so much!). I've earmarked the money for more fabric. I learned so much and I'm much more confident in my furniture fashioning abilities. It's something I see more of in my future ;). The best part, though? One day, when baby M is grown, I get to tell her I made this for her. This is a fabulous skirt pattern. I was sold on it after I saw Tilly's week of wearing Beignet skirts. I was a little intimidated at first, just by the number of pattern pieces. It looks more complicated than it really is. I made this skirt in a hurry. I started it three days before we left for Nola. I cut everything out one night and then had a marathon sewing session the next day. I constructed the whole skirt in one five hour sitting. It went together quickly and without any mishaps. I slip stitched the hem and sewed the buttons on the first morning of our trip. I did it while sitting on the couch at our bed and breakfast, Maison de Lagniappe (built in 1831). The activity of hand sewing felt right at home there, like someone had been sitting there doing the same thing a hundred years ago. I'm proud to say I used all stash fabric and notions. The shell is a black cotton twill. I put a caramel colored piping in the princess seams. I used a similar caramel colored cotton sateen for the facings. I wanted the facings to roll outside a little to mimic the piping. The lining is red because that's all I had available. I love that it is fully lined. And I decided to use some fun cotton for the pockets. I love fun little details. I guess that's why I like making my own clothes so much. The buttons are wooden. I don't have a lot to say about the construction process. Everything fit together perfectly. I cut an 8 at the waist and graded to a 10 at the hip. The measurements are just slightly larger than my own. I wanted the skirt to not be quite so high waist-ed. I find when I wear things right at my waist I'm always tugging them down a little. The skirt was a bit too big when I was finished, but I adjusted by placing the buttons about an inch in from the pattern markings. I love the step of sewing twill tape on the waist band seam. I wore the skirt all day long traipsing around the French Quarter with no stretching. The only real trouble I had was putting the buttons in the right place. There were several I had to remove and readjust. It's still not exactly right-- just a tiny bit uneven at the hem. A picture not in front of my brick chimney! All in all, I'm very pleased with my new skirt. I highly recommend it. I'm already planning another. I wonder if a long version would be nice? Sure would be a lot of buttons. Happy sewing everyone! I just returned home from a trip to New Orleans. We went for a wedding. I wanted to share some photos from our trip. New Orleans is a beautiful and enchanting place. But also exhausting. We ate incredible food. I didn't meet a single unfriendly person. Bourbon Street was actually my least favorite part of the trip. I'm glad we got to see it, but it was a little seedier than I expected. I highly recommend staying at Maison de Lagniappe in Marigny if you ever get a chance to go. The first few photos are all from there. The house was built in 1831. Walking distance from the French Quarter. I, unfortunately, did not take any photos of the wedding we attended. It was at one of the most fabulous houses I've ever been in on St. Charles in the Garden District. The photos I've posted are all from from our time around the Quarter. And yes, of course I made a Beignet for the trip. I'll post photos of that soon. 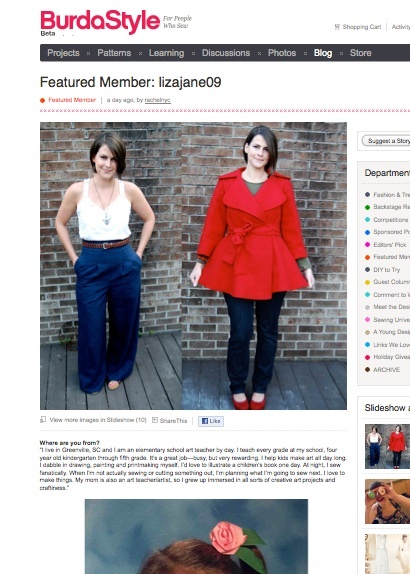 I'm Burdastyle's featured member this week! And if you are visiting from Burdastyle-- Welcome! I want more time to sew, my friends. No-- I need more time to sew. Grown-up responsibilities seem to be getting in the way of my fun time lately. That's all I'm whinging about really. I'm sure you know what I'm talking about. Laurwyn just posted about this exact dilemma- How do you make time to sew? 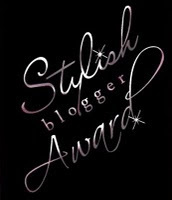 On another note, Carolyn and Amber nominated me for the Stylish Blogger Award. Thanks, both of you! I'm totally flattered. Not feeling so stylish lately- just scattered. I'm nominating two newer (to me) blogs I like to read. Jan-ul. I like that she posts about sewing and art. And Lorena of Elloh Handmade. Her weekend recap posts are what inspired my "seven things" below, though my pictures aren't quite as nice. I decided I wasn't clever enough to write seven things about me, so I took pictures instead. I took my camera to work today. Some photos are from home, too. No captions. Just pictures. Hope everyone has a fabulous rest-of-the-week! Okay, I have to write about this last photo because I have to gloat a little. I found a handmade dress at Goodwill only to discover later that it's made from Liberty of London cotton lawn. Yes, I said Liberty. Cost me a dollar. Now what to do with it?